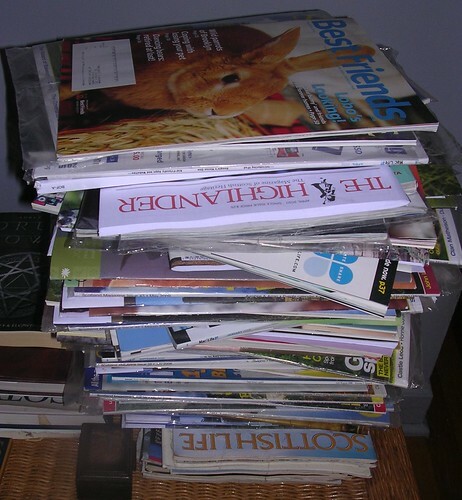 Half-way through the year and this is the stack of magazines on the ottoman. This is it. I've been reading them religiously in an effort to finish off the stack. I'm probably reading a magazine and a half a week. Three years ago, this was the stack. It represented several years of "I'll get around to it" and slapping the magazine on the top of the pile. I remember knocking this pile over several times. I thought, "I should just pitch these", but I never could. I reorganized the stack and grouped same titles together, mostly. An errant magazine often pops up on top of the stack. Hmmmmm. I thought I read all the Best Friends. Guess not. I'm reading magazines from 2010. Earlier this month, I read about Best Friends' efforts to save the dogs used by Michael Vick in his dog fighting enterprise. Most of those dogs found forever homes thanks to Best Friends. A couple have passed over the Rainbow Bridge, but they found out that there are humans who will love them and not force them to fight. It was interesting to read about the initial efforts made on behalf of these dogs because I've known for awhile about the success Best Friends had in rehabilitating the ones brought to the shelter. The magazines about Scotland are also quite interesting. Most of the main articles are relevant whether I'm reading a magazine from 2013 or 2010. The only difference is in the "current events" columns. "The museum is undergoing a complete renovation and is slated to reopen in 2012." Um...well, I hope they reopened. Sometimes, I go to the URL and find out that, yes, indeed, they did open or a fund raiser was successful or a construction project came in on time and doubled the size of the space. I figure the longer I have the magazine, the more they will revisit something I remember reading. That's happened a couple of times now, with reference to a previous article. In one case, I had just read that particular magazine a few months earlier. No, they aren't in chronological order. That would be too OCD. I'd rather just skip from month to year in a hodge-podge fashion. So, seeing the stack so close to being gone means I often come home, plop down in the recliner, get Pilchard in my lap and just read for a couple of hours. It feels like a great accomplishment to be this close to having nothing in that spot. What will I put there when the stack is gone? Well, I'm looking toward the day when whatever magazine arrives will go there if I can't read it right away. I get Best Friends, Cooking Light and Scottish Life. I also get a quarterly cross-stitch magazine but I read that right away. (Don't look at me like that. 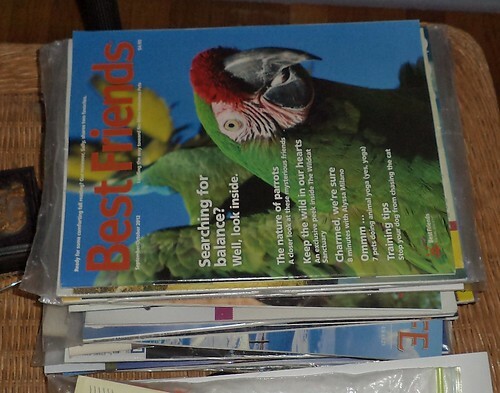 Yes, I have boxes of cross-stitch magazines, but I like seeing new projects.) There won't be a magazine lying there for years waiting to be read. Probably my current book or cross-stitch project will go in that empty space. You know what else would fit? A cat. I'm sure, once the space opens up, it won't take long for someone to find it. I believe that's a law of cat dynamics. "An empty space must be occupied at least once." I'm proud of myself. Yeah, it took 3 years to get to this point, but, truthfully, it took just as long to create the pile. The end is near. I'm looking forward to it.